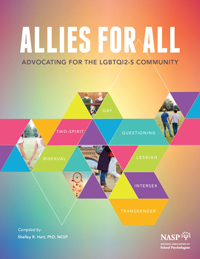 As a school psychologist, you are charged with the task of bringing together individuals to support the needs of all students, particularly those in the LGBTQI2-S* community. Use this printed, plastic-coil bound collection with district leaders and parents to understand their experiences, address challenges, and effect change. Understand the prevalence of bullying and school victimization. *In the above acronym, 2-S refers to Two-Spirit, referencing the Indigenous American culture with regards to gender identity.